Twenty years ago, the body was “forbidden territory” for psychologists. During her years of clinical work, author Bo Forbes discovered that the body holds an essential key to healing anxiety (chronic or intense worry and physical agitation) and depression (long-term or acute sadness and physical lethargy). She found that feeling is more healing than thinking. Also a long-time teacher of active flow- and alignment-based yoga practices, Dr. Forbes noticed that practicing restorative yoga (restful, rejuvenating, yogic relaxation), her clients experienced improved mood, increased self-compassion and kindness, and a stronger sense of connection with others. Now, in Yoga for Emotional Balance, she presents restorative yoga techniques and breathing exercises to help those who experience anxiety and depression to rebuild emotional health. Yoga therapists, yoga teachers, psychotherapists, and other healthcare professionals will also find tools to integrate into their practices. Emotional imbalance is common in today’s culture of stress, multitasking, consumerism, and achievement. Restorative yoga quiets the mind, making it more reflective while the body relaxes deeply. It is a subtle yet powerful practice which can be challenging when we are faced with feelings we may have avoided or stored for a long time. Using restorative yoga, reflection and insight become embodied and thereby have a more lasting effect. 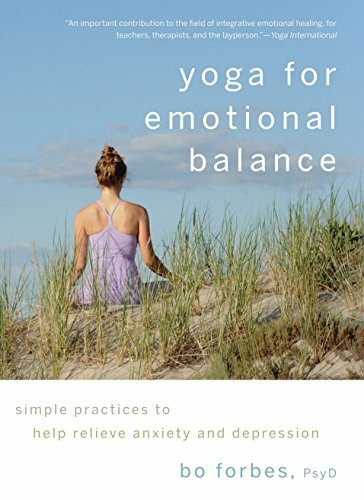 Yoga for Emotional Balance includes chapters which cover how the mind and body work in anxiety and depression; three obstacles to emotional balance and why mental understanding alone doesn’t work; the mechanisms of true healing in human psychology; five key ways to transform emotional patterns; how to find meaning and opportunity in anxiety and depression; four primary types of emotional imbalance; and how to identify one’s emotional type and choose the practice sequence that best fits one’s type. The practices work for anyone regardless of age, energy level, physical health, or familiarity with yoga. When one undertakes 15–30 minutes of twice-weekly breathing exercises and restorative yoga, one’s thinking can become less emotionally reactive, and one is better able to tolerate challenging emotions, feeling less anxious or less depressed. The poses build new body experiences that differ from anxiety and depression. The body and mind remember the sensation of being not anxious or not depressed, strengthening the healthier pattern. Our culture promotes an inner fantasy of instant healing. But steady and progressive change is what lasts. The restorative yoga sequences in Yoga for Emotional Balance are designed to be practiced intentionally and repeatedly, for that lasting change to occur. All of the poses are well described in soothing language and demonstrated with pleasant, useful photos. The shots are black & white against a simple set, capturing the gentle aspect of the restorative practice and reflecting a feeling of calm. The practices in the book are supplemented by audio instructions which are downloadable from the publisher’s website and which are given in clear speech, paced for actual practice. The audio begins with three breathing/body practices and continues with two practice tracks. There are six poses for balancing anxiety in body and mind and five poses for lifting depression in body and mind. The audio provides more detailed instruction than the text; the book includes more guidelines for additional support in the poses. Text-only instructions are given for the stabilizing practices for healing mixed anxiety and depression. Case examples are included throughout Yoga for Emotional Balance. There’s a helpful Frequently Asked Questions section, a guide to sourcing and using props, a discussion of common challenges and how to meet them, and suggestions for addressing discomfort. Dr. Forbes also provides a set of questions to help find meaning and spiritual growth in the experience of anxiety or depression. Emotional imbalance is not a modern problem. Dr. Forbes concludes Yoga for Emotional Balance with a reference to the ancient scripture the Bhagavad Gita, wherein the warrior Arjuna finds himself in emotional turmoil. He is anxious and afraid and feels depressed and helpless. He consults his charioteer, confidant and lord, Krishna, who teaches him about three states of being. Rajas is a state of agitation and anxiety; tamas is a state of inertia and depression; sattva is a state of poise which arises from dedication to self-study and from development of mental and emotional evenness. Arjuna’s path to emotional balance was not direct or predictable, nor is the modern reader’s. But Arjuna was able to experience sattva, and so can the modern reader. When one remains neutral and inquiring, difficulty becomes part of the practice rather than an obstacle to it. Yoga for Emotional Balance is for everyone who is willing to commit to self-care and be an experiment unto themselves, finding emotional balance, perhaps losing it, yet finding it again and again.